The board ARTEX developed and produced by DWave is an Arduino DUE compatible shield. It is used to provide to the Arduino DUE board external isolated analog or digital inputs and relay output. The three of the six digital inputs are connected to the Arduino DUE encoder inputs. All digital inputs are in negative logic. The two analog inputs are isolated. The related on-board ADCs are connected to the Arduino DUE SPI bus with two separate Chip Select. 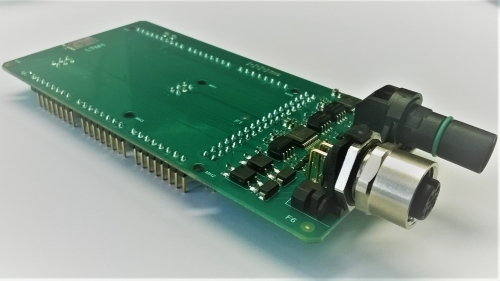 For more information regarding this topic, please, refer to the Arduino DW0105-00 software library.All digital/analog inputs are included in JP9 connector. The solution also includes two isolated output Relays (Normally Open) included in JS3. All input and output are mutually isolated except all signal with the reference in common (see pin description). Price: 120 € 1 pcs. shipping costs excluded.